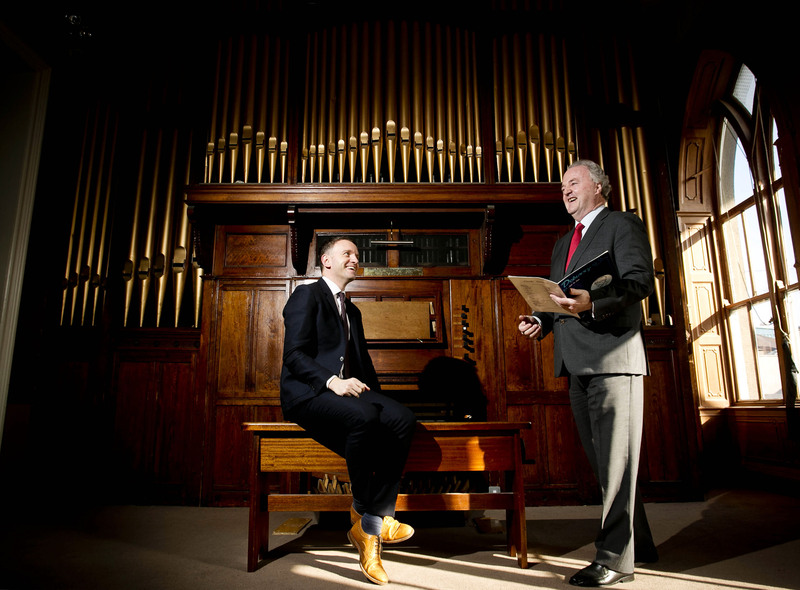 Pictured from left to right, Andrew Hetherington, CEO of Business to Arts and Brendan Murphy, CEO of Allianz Ireland hitting a high note at the launch of the Allianz Business to Arts Awards 2016. This year we mark our Silver Anniversary – 25 years celebrating world-class relationships across arts and business. The Allianz Business to Arts Awards recognise and champion the spirit of collaboration between businesses, artists and arts organisations that develop creative partnerships; bringing the arts and artists into mutually beneficial relationships across society. Closing date for applications is Monday 9 May 2016 at 5pm. Click here for information on the application process and to complete the application form. 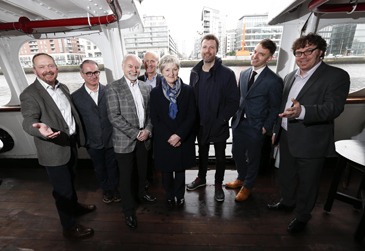 Pictured above are Charlie Murphy, Dublin Port, Gary Sheehan, National Concert Hall, Simon Taylor, National Concert Hall, Eamonn O’Reilly, Dublin Port, Lucy McCaffrey, Paul Noonan, Andrew Hetherington, Business to Arts and Matthew King, National Concert Hall. Picture by Conor McCabe Photography. Dublin Port has recently announced details of ‘Starboard Home’, a unique collaboration featuring 12 of Ireland’s foremost songwriters. Presented in association with the National Concert Hall, ‘Starboard Home’ has been commissioned by Dublin Port as part of the Ireland 2016 Centenary Programme. Twelve leading names in contemporary music have been invited to compose and perform new songs inspired by the relationship of the Port with the City. These include: Paul Noonan (BellX1), James Vincent McMorrow, Cathy Davey, Duke Special, Gemma Hayes, Jape, Colm Mac Con Iomaire, Lisa O’Neill, Declan O’Rourke, John Sheahan (The Dubliners) Paul Cleary (The Blades) and novelist Caitriona Lally. Produced by acclaimed Irish songwriter Paul Noonan (Bell X1 and Printer Clips) and Gary Sheehan at the National Concert Hall, ‘Starboard Home’ reflects on the complex relationships between the Port, the City and the Liffey through song, ranging from elegant electronic pop to sublime trad inspired moments and crafted song-writing. This remarkable set of songs presents a contemporary and panoramic view of Dublin as a port city. The artists gathered at Sun Studios in Dublin during February 2016 to collaborate and record ‘Starboard Home’. Bringing together a new band featuring Nick Seymour (Crowded House), Brian Crosby (formerly of BellX1 and The Cake Sale) and Glenn Keating (I Am The Cosmos and Jape), the artists have recorded all the new works for an album to be released in June 2016. Starboard Home Premiere Concert will take place 22nd June 2016 at the National Concert Hall. ‘Starboard Home’ is the latest in a series of cultural and heritage initiatives by Dublin Port designed to present Dublin’s rich maritime heritage in new and thought-provoking ways. Dublin Port has created a modern interpretation for the Diving Bell on Sir John Rogerson’s Quay, part industrial heritage, part sculpture. Cliona Harmey’s Dublin Ships installation graced the Scherzer Bridge on North Wall Quay for nine months during 2015 intriguing passers-by with ever-changing couplets of ship names. Artist Feargal McCarthy created a replica installation of Dublin Port’s Northbank Lighthouse as part of the Science Gallery’s HOME\SICK 2015 exhibition with support from Dublin Port. The Port has more recently commissioned artist and NCAD graduate Eimear Murphy to create a new sculpture that will provide a focal point for Port Centre on East Wall Road, fashioned from contemporary materials which are the language of building and industry. Dublin Port is currently co-operating with Dublin City Gallery The Hugh Lane to bring an exhibition of the works of Antwerp’s port artist Eugeen van Mieghem to Dublin in 2017.
Business to Arts is delighted to announce the appointment of Helen Carroll to the position of Senior Manager – Marketing & Strategic Partnerships. Helen joins our team to develop and implement strategies that enhance the visibility and impact of our many programs, partnerships, services and events. Prior to joining Business to Arts, she was Assistant Manager of the Bord Gáis Energy Theatre, overseeing all operational, contractual, and financial aspects of productions, events and conferences. Having worked as Senior Marketing and Press Officer prior to this, Helen developed and implemented strategic marketing campaigns and sponsorship opportunities for international and national productions. In the past she has also worked for Dance Theatre of Ireland, EventHaus Ltd. and IMG Artists, London. Helen graduated with a Masters in Cultural Policy & Arts Management from University College Dublin in 2011 having previously obtained a Bachelor in Laws (LL.B) from Trinity College Dublin. She is an Associate of the Royal Irish Academy of Music (ARIAM, 2006) and received a piano performance diploma from the London College of Music (Dip,LCM 2004). She is also an Associate and full teaching member of the Royal Academy of Dance, London.